Whoa, that is a busy cover even by Saunders standards. I mean, how many distracting elements could the guy fit into a single image? The crime here is that I cannot read the cover blurb. Fiction House had the best blurbs ever. The supreme examples were probably reserved for Ki-Gor yarns in Jungle Stories, but Lariat Story had some glorious examples. Yeah, it's busy, all right. I wish the scan had been a little better. I worked on it but could only do so much. When I blow it up, I can read most of the blurb: "South of the bordeer swept the Texas tornado renegades, hell-bent with havoc for the [half-breed?] senorita and her gringo gun-boss!" 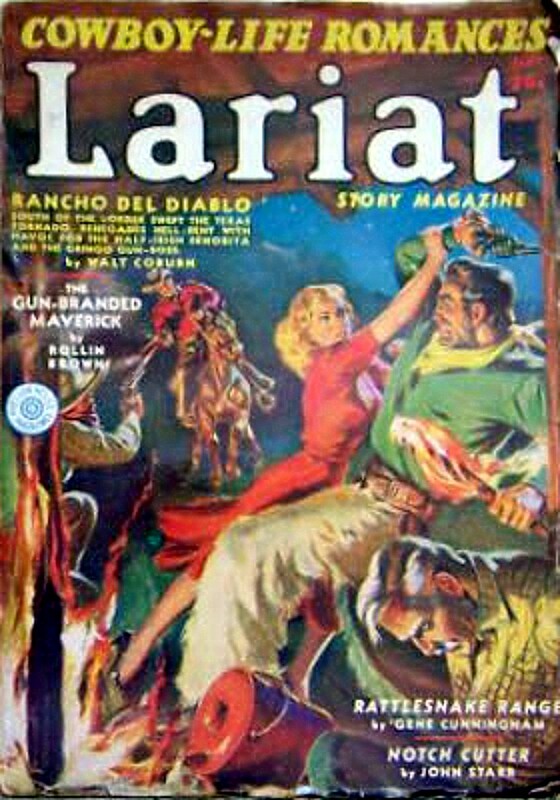 Was RANCH ROMANCES success so overwhelming that any western pulp was going to attempt to claim kinship...or did LARIAT actually feature a fair amount of romance on the range? A little of both? Todd, I believe you're right about the half-Irish senorita. 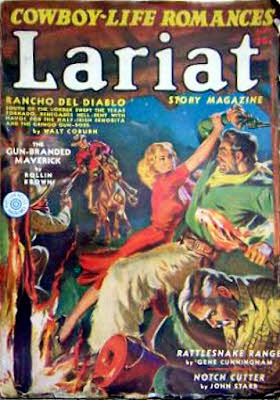 The stuff I've read from LARIAT STORY doesn't seem to have any more romantic elements than what you'll find in the other Western pulps, but that was often the case in RANCH ROMANCES, too, at least in the Forties and Fifties. Though the LARIAT STORY cover says "Life Romances", it was not romance oriented but was like the other western pulps which published stories of the west. The covers, like many of the Fiction House titles, stressed good girl art in order to attract the male reader. The same applies to NORTHWEST ROMANCES. A pretty girl showed up in many of the stories but the main thrust was action and not love.